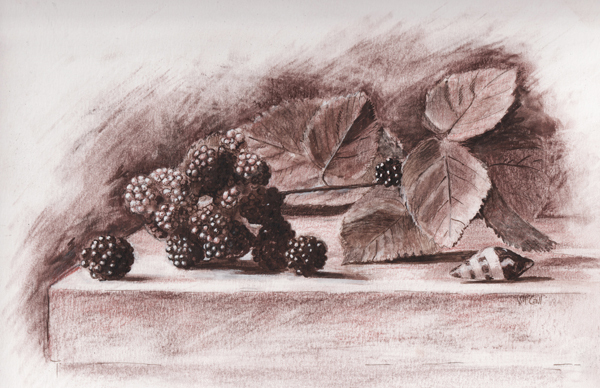 My sketch today (charcoal, ink, conte crayon and gouache on paper) is a simple study of a cluster of blackberries with stem and leaves. This image conveys a summery, sunny feel hinting at outdoor walks and gathered things. But it can also be viewed a little more pensively as the cluster contains some lighter colored, sour, unripe fruit along with the dark, sweet, ripe berries - while off to one side a quiet little shell sits alone. In keeping with that pensive tone (but with an entirely different thought), the following Emily Dickinson poem on the subject of blackberries seemed to be an interesting accompaniment to today’s sketch. Ok so now I need one of Mammy’s coblers! Totally!! With vanilla ice cream?